No water-purification device is capable, by itself, of removing all of the toxics from drinking water. Many unscrupulous companies and salespeople sell water-purification equipment to cash in on people's fears about polluted water to make quick money. No programme for creating an awareness among the people about arsenic contamination, water management, nutrition or which measures to take to face the arsenic threat appears to have been taken up (Sylvia Mortoza, 10. 05. 01). A study in Thailand shows that drinking arsenic contaminated water influences children's intelligence. The study of intelligence levels among case and control alerts us that the arsenic contamination and poisoning is not limited to the Ronpibool District but is spreading to the district of Sao-tong and possibly several more. At a certain level, arsenic has a significant effect on the children's development and learning abilities of children as shown from the IQ study (Chanpen Choprapawon, 2001). Millions of school children (5-17 Years old) are drinking arsenic contaminated water. Almost 80 percent of rural population is analphabetic. Arsenic mitigation can be highly successful, if school students/teachers can be educated and transfer their knowledge to their parents and neighbours. The aim is that "learning by doing", to work out simplest ways to obtain arsenic free water and environmental conscious education. About 120 students in a class. No money for education. Five teathers for sixhundred students. This project proposal is different than other projects. We intend to introduce traditional methods - by the school students and for the students and parents. This extraordinary project is based on traditional wisdom of the rural population of Bangladesh to help the poorest group with meaningful assistance that can reproduce and distribute the knowledge to others not only to obtain arsenic free water but also sustainable development of social, cultural and traditional heritage. The NGOs and companies distribute the filter but due to clogging, no device for back-washing and colouring of water, growth of pathogen within the filter and expensive to replace etc. people refuses to use them: Available arsenic removal technologies are neither cost effective for the poor nor easily operable and maintainable. For example devices based on sorptive techniques need periodic regeneration by washing as flocculate particles clog the filter media slowing down flow rate which makes those devices cumbersome to use After some days there may arise filter media which demands extra replacement cost. The risk of harmful bacteria can grow and increase substantially within the filter, if it is not properly maintained. Another process is coagulation-flocculation-co-precipitation with chemicals that may leave harmful residual elements in dissolved state in water. If coagulated with alum and potassium permanganate, there is a chance of having residual aluminium, potassium etc. in treated water that may have toxic effects on human nervous system. DPHE and DANIDA have introduced this system. In Faridpur they have distributed two-bucket system, but no body uses it. There are several expensive filters are available in the market, but nobody knows their effectiveness. None of the project has arsenic disposal programme. In Bangladesh most of the rural population is still uneducated and most of the arsenic mitigation projects have been failed. Teachers and students are targeted for environmental education and can make greater impact on their parents. Our goal is to transfer knowledge on water, air, and soil - special emphasis on water. How to combat present disastrous situation through arsenic poisoning. 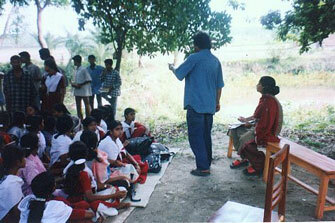 Remove social isolation of arsenic affected students. Priority of the project is to give people an immediate cheap solution. Our studies show that "Open Dug Holes" with filters is the simplest solution. But we aim to obtain waterborne disease free water at affordable means. Rain water harvesting with affordable means. British Geological survey (1998) has compiled nation-wide distribution of arsenic in groundwater at union level on computer and geocoded to thana (Police Station) level that indicates that southwest region is extensively contaminated. The most intensely contaminated areas are found along the Lower Meghna in the greater districts of Comilla, Noakhali, Kustia and Faridpur. But more arsenic contaminated areas are discovered after water test. Faridpur is one of the "hotspot" worst arsenic affected areas of Bangladesh. We intend to introduce 6 arsenic free water units for 6 schools in the rural area of Faridpur district. In other words about 7, 000 students will get arsenic free water, education and environmental consciousness that will influence their parents. More than 60 percent of the students in rural Faridpur are women. Infants and young children can be more vulnerable to chemicals and other pollutants in the food they eat because pollutants can impact their developing systems resulting in lifelong effects. Children also eat three to four times more food in proportion to their body size than adults, which means they ingest proportionately more chemical and infectious agents. Children are also more likely to eat with unwashed hands and to ingest food that has been in contact with the ground or floor, thus increasing their exposure to foreign substances. Infants and young children also have a less varied diet, relying more on fruit and milk products, which can greatly increase their exposure to certain environmental contaminants. You can prevent environmental risks to your children by ensuring they have a balanced diet with good nutrition, and avoid eating large quantities of foods with potentially high levels of pollutants. Teachers and students are the most powerful ambassadors of present and future generation in a country where majority of the population is analphabetic. Introducing inexpensive sand filter using local clay pot, sand (and charcoal, if water is contaminated with pesticides, etc.). Cleaning, maintenance and self-production of sand filter, which can be easily, reproduce all over the country. Innovating clay potters to introduce optimal water containers and sand filters and importantly protecting dug wells from surface and surrounding geological formation. Disposal of arsenic precipitates in cow-dung pits or sanitary. Introduction of bio-pesticides and additional income through home- garden. Stop using polythene and aluminium products. Export of natural sustainable products from villages to cities. Cultural and social meetings for transfer of knowledge, environmental consciousness and to solve social conflict. 7. 4. HOW CAN I PROTECT MY WATER? 13. 2. How Might I be Exposed to Arsenic? 13. 4. How Arsenic Affect My Health? March 8 to April 23, 20002. Selection of location after drilling and construction of Dug Wells. Demrakandi Primary and High SchoolKoijori Union, Faridpur. Photos: photo: school lesson1.jpg, school practical 1.jpg Students of class 9 and 10 attending theoretical and practical courses. 50 percent population of Bangladesh is less than 17 years old. Infants and young children also have a less varied diet, relying more on fruit and milk products, which can greatly increase their exposure to certain environmental contaminants. You can prevent environmental risks to your children by ensuring they have a balanced diet with good nutrition, and avoid eating large quantities of foods with potentially high levels of pollutants. Pesticides are substances intended to destroy, control or repel pests, such as insects, weeds, fungi, rodents, and bacteria. Depending upon the dose, pesticides may cause a range of harm such as cancer, acute or chronic injury to the lungs, nervous, reproductive, endocrine and immune system damage and may accumulate in the environment. Children are at greater risk of pesticide exposure than adults because pound for pound of body weight, children not only eat more and breathe more, but they also have a more rapid metabolism than adults and they play on the floor and agricultural fields/lawn where pesticides are commonly applied. A child is taking water from the pond, a red flag indicating pesticide has been used to kill all living organisms - pre treatment for aqua fish culture. Water is contaminated with Endrin (Dirty Dozen), a banned pesticide. Pesticides are used in Bangladesh to conserve food, wood, stored with daily household goods etc. Without knowing that they can cause serious health hazards. There are innumerable reports of deaths in the newspapers on pesticide poisoning e.g.- the whole family died after eating spinach that was handled with dangerous pesticides. About 200 species of migratory birds arrive in Bangladesh during winter months. More than 129 species of residential birds contribute faunal diversity. Twenty-five species of resident and migratory bird are endangered and threatened and the rest are vulnerable (IUCN, 1997). Increasing use of hazardous pesticides, disappearance of wetland, pollution of industries has dramatically reduced biodiversity and specially birds. Nature can live without us, but we cannot live without nature. Birds eat many harmful insects and reducing birds mean we have more harmful insects. The most shocking news about killing migratory bird is that children from very low-income family collects small fish and apply a dangerous pesticide locally named "Furfurans" to trap birds in the wetlands. As soon a bird eats a small portion of the fish dies immediately and the children cut the head for daily meal!!! A parent at Shibrampurr was proudly describing how his son brought fourteen birds for evening meal. It is sad to notice that migratory bird are openly sold in the market and many school going boys in rural areas kill unnecessarily birds with air gun. It is necessary to make consciousness education and regain traditional Bengali heritage to protect our "loving birds". People are asking many questions. How safe is my drinking water? Where does my drinking water come from, and how does it get to my home? My water may be safe now, but what about in the future? What can I do to help protect my drinking water? Drinking water comes from surface water and ground water. Large-scale water supply systems tend to rely on surface water resources, and smaller water systems tend to use ground water. The contaminants in drinking water are quite varied and can cause a range of diseases in children, including cancer, developmental effects such as learning disorders, and acute diseases such as gastrointestinal illness. Children are particularly sensitive to microbial contaminants because their immune systems may be less well developed than those of most adults. Children are sensitive to lead, which affects brain development, and to nitrates, which can cause methemoglobinemia (blue baby syndrome). Microbiological and chemical contaminants can enter water supplies. These materials can be the result of human activity or can be found in nature. For instance, chemicals can migrate from disposal sites and contaminate sources of drinking water. Animal wastes and pesticides may be carried to lakes and streams by rainfall runoff or snow melt. Human wastes may be discharged to receiving waters that ultimately flow to water bodies used for drinking water. Coliform bacteria from human and animal wastes may be found in drinking water if the water is not properly treated or disinfected. These bacteria are used as indicators that other harmful organisms may be in the water. You can protect your water supply by carefully managing activities near the water source. For households using a domestic well, this includes keeping contaminants away from sinkholes and the well itself. Hazardous chemicals also should be kept out of septic systems. Source water protection works by involving all members of the community. Citizens can voice their support for controlling how land is used near drinking water intakes. Citizens can also educate their neighbours about the danger that household chemicals pose to drinking water supplies. Many communities sponsor household hazardous waste disposal days to promote proper handling of waste paints and thinners, pesticides, used oil, and other hazardous materials. To protect public health and the environment from the risks posed by pesticides and to promote safer means of pest control. In Bangladesh several people dies because of pesticide poisoning. Many traders use pesticides to conserve dry fish, rice and lentils in Bangladesh. Two third of Bangladesh is wetland. Protection of wetland has enormous importance for protecting environment and economy of the country. Wetlands provide many benefits, including food and habitat for fish and wildlife; flood protection; shoreline erosion control; natural products for human use; water quality improvement; and opportunities for recreation, education, and research. Arsenic is found in nature at low levels. It's mostly in compounds with oxygen, chlorine, and sulphur. These are called inorganic arsenic compounds. Arsenic in plants and animals combines with carbon and hydrogen. This is called organic arsenic. Organic arsenic is usually less harmful than inorganic arsenic. Most arsenic compounds have no smell or special taste. Chronic arsenic poisoning, whether through ingestion or inhalation, may be manifested by many symptoms. Digestive disturbances such as nausea, cramps, constipation or diarrhoea with associated weight loss are likely, and liver damage may also occur. Disturbances of the kidneys, the nervous system and of the blood, such as anaemia, are not infrequent. Arsenic may cause a variety of skin abnormalities, including itching and pigmentation. These effects may result from dermal exposures or from systemic distribution. Chronic dermatitis commences with patchy erythematic and may lead to papular or vesicular eruptions. Optic and peripheral neuritis may also develop with prolonged exposure. Aplastic anaemia has also been observed. HOW COULD I BE EXPOSED TO ARSENIC? Arsenic can be consumed by either drinking arsenic-contaminated water or by eating food that has been cooked in this water. Arsenic may be inhaled by breathing in dust or smoke that contains arsenic. Smoke could come from burning wood treated with preservatives, the dust from industrial process. Some industries use arsenic compounds that can be absorbed through the skin if direct contact occurs. Arsenic in water or food does not evaporate into the air, and is not easily absorbed through the skin. The largest source of arsenic comes from the food we eat every day. Some fish and seafood contain high amounts of organic arsenic. This type of arsenic is much less harmful to humans than inorganic arsenic from the groundwater. WILL ARSENIC IN MY WATER CAUSE HEALTH PROBLEMS? DOSE - How much arsenic am I exposed to? DURATION - How long and how often have I been exposed? TYPE of ARSENIC - Have I been exposed to inorganic or organic arsenic? WHAT SHOULD I DO IF THERE IS AN ELEVATED AMOUNT OF ARSENIC IN MY WATER? Arsenic guideline. Generally, samples taken weeks or months apart have not shown significant change in arsenic levels. Connection to a public water supply system is the best solution. For example, Faridpur town water supply water contains less arsenic than permissible standard. When this is not possible, well replacement or modification may be an option. However, well modification may not always be effective. Keeping the water over night in a clay pot can reduce arsenic but about 70 percent arsenic is reduced - still too high for drinking and cooking. It incorporated sand with an effective size of fine sand. This very fine sand produced good quality of water of low turbidity. Rapid sand filter might vary in effective size of coarse sand. Development of the coarse-to-fine principle of filtration has taken place in two major steps. Basically this provides a two-layer filter in which coarse upper of coal (sp.gr. 1.4) acts as a roughing filter to reduce the load of particulates applied to the sand (sp.gr. 2.64) below. Dual media filter can retain more material removed from water than sand filter. The size of the media particles should be uniformly graded from coarse-to-fine in the direction of flow through a filter bed. US Environmental protection agency describes microorganism can transform to gaseous arsenic hydride. Arsenic waste can be disposed on a prepared bed of cow dung in a shallow hole dug in earth or each house in the villages has for the women sanitary (Kacha Paykhana). The microorganisms in cow dung or in the open sanitary transform the arsenic to gaseous and arsenic is thus released into the surrounding air. Bangladesh has the advantage that the industrial countries do not enjoy to dispose of arsenic sludge into cow-dung or open sanitary at zero cost. This project intends to support traditional plants that are threatened to extinct. To most Indians and Bengalis, turmeric or halud (Bengali)/ haldi (Hindi), is a part of growing up, a magic cure-all for the excesses of childhood. A classic "grand mother's remedy', the virulent yellow powder or paste has been applied to scrapes and cuts of generations of children (A. Agarwal and S. Narain,1996). Improve intestinal haemorrhage, bowel function, stops irritating substances, reduces fatty compounds and perhaps stops cancer etc. Now about 12 patents have been registered in the USA although turmeric has long been used in India as a traditional medicine for treatment of various sprains and inflammatory conditions (Indian Journal of Medical Research, 1982). A lack of regulations is allowing foreign scientists to claim exclusive ownership of traditional medicine that we have used for centuries. While travelling arsenic affected areas in Bangladesh, it was a great surprise, to hear that many arsenic affected women after trying many modern medicine switched to the juice of raw Haldi (turmeric) and found astonishingly good result. Use of turmeric is widely known in ancient Ayurveda. At Purboganabarti Village Hamida, an arsenic patient with arsenic lesions on hand palm was advised to take green curcuma juice and arsenic free water. After six weeks her lesions began to disappear. In ancient Sanskrit literature (1500 BC) Neem regarded as life saving and disease preventive plant. It belongs to the family Meliaceae. Leaf, bark, seed and all part of Neem tree contain useful substances that can be taken as tee, oil and prepared medicine remedy dust allergy, fever, skin diseases, rheumatism etc (Roemmming, 1999, Nature). Professor Heinz Rembold, of famous Max-Planck Institute of Biochemistry, Germany found any side effects of the use of Neem on human and soils do not contain any hazardous substance as a residue after being used as pesticides. We have visited several schools of Faridpur District. Some School committees were reluctant to take part with the project. It seems that committee members of some schools want personal benefits e. g. Shibrampur High School, Union Ambikapur, Rousennessa Primary School, Shameshpur, Union Koijori although the students are drinking highly contaminated water. 108 pages of educational material for students and teachers and charts are prepared and distributed among students and teachers. 10 hours of courses have been completed in this school. 70 percent students are female. 8 hours of courses have been completed in this school. 12 hours of courses have been completed in this school. 70 percent students are female. 8 hours of courses have been completed in this school. 70 percent students are female. Primary school teachers of Koijuri Union have agreed to take part the course on a day program. This will held during 2nd phase of the project. It is pity that there is any course in sport, music and painting in school education system of Bangladesh. Students are attending course on water and wetland. Excursion for example a visit to Water Supply, Water purification units, wetlands etc. was not possible due to rejection of field trip by SEMP. An Easy Alternative to Obtain Arsenic Free Water Our studies show that dug wells do not contain arsenic (very low), where as neighbouring tube wells contain extremely high amount of arsenic in water. "Dug well" is an indigenous technology and social acceptance is very high and can be constructed with local available source. Construction of such wells with terra cotta rounded clay slabs; walls protected with clay jute layers etc. can provide bacteria free water. Simple sand filter produced and maintained by the villagers can eliminate bacteria. Unfortunately these dug wells are very rare and almost vanished after the introduction of tube wells. Such dug wells can be constructed only during dry period. Dug well can be used in villages of West-Bengal-India and Bangladesh for drinking purpose after taking care of bacterial contamination & assessing the quality of water. Water from open dug hole can be improved through protective measures. Pathogen, bacteria, viruses can be removed through solar radiation (no cost) and other methods at site acceptable appropriate measures. It is easy to remove bacteria but present experience in Bangladesh and India show that household methods of arsenic removal have totally failed but donors and NGOs ("more monitoring is required for these filters before it can be recommended") are continuing to fruitless target. The British Geological survey (BGS, 1998) suggests that within the zone of water table fluctuation and where residence times are short, arsenic is flushed away or immobilised. Ancient dug wells at Mahastan (300 B.C.) recently excavated by Lyon University, France. First, it is filtered ; contaminants in the wastewater become lodged in the voids and spaces that exist in all soils, much as occurs in an activated carbon filter (Coffel, 1991). Countless microbes inhibit in most soil. Microorganisms in soil remove nitrogen, Germs, bacteria, and viruses. Soil is, in fact, more resilient in handling the constantly changing blends of toxic materials. The diverse community of organism present in soil are better able to react to changes in the chemistry of the wastewater to be treated. Soil filters are more effective when plants are grown on them. Achievement more than 200 per cent. There are wells that are highly contaminated but a few wells show ground water arsenic concentration is far below Bangladesh standard. It may sound puzzling but the aquifers are different. Local relief and rivers impact on the direction and velocity of groundwater flow and therefore on the migration of arsenic. Groundwater flow from high to low relief causes deeper penetration contaminants into the aquifer. The reverse is true in areas that are low in relief. Here upward groundwater movement would bring contaminants to shallower horizons. Photo: Modern mid channel bars in Brahmaputra River. Such aquifers in ancient channel bars show in many cases arsenic free. A sound knowledge on underground geology, hydrology it is possible to identify arsenic free aquifer at shallow depths. This is a very cheap and highly acceptable alternative. At Khailpur most of the wells are arsenic contaminated but in some areas a few wells found to be arsenic free. At Kahailpur after 12 drilling arsenic free aquifer has been identified at depths 40-55 feet within channel sand facies. This method can be applied to other areas for easy and cheap access of arsenic free water. This needs careful formation evaluation and routine monitoring. Hammer drilling equipment or vibro-core is required, unfortunately it is not available in Bangladesh. Rainwater harvesting -- in one form or another -- has been in practice for thousands of years. According to Paul Woods of Texas A & M University, extensive water harvesting systems in the Negev Deserts of Israel more than 2,000 years ago have been documented. Rainwater collected in various parts of the USA contains (in milligrams per liter): Fe (0.015) , Ca (0.075-1.41), Mg (0.027-1.2), Na (0.22-9.4), Ca (0.075-1.41), K (0.072-0.11), HCO3 (4-7), SO4 0.7-7.6), Cl (0.22-17), NO2 (0.02), NO3 (0.02-0.62), and Total Dissolved Solids 8.2-38), and pH of 4.9 to 6.4. Most of these concentrations fall within the safe limit prescribed by the US Environmental Protection Agency, some exceed safe drinking water limit. There is a long established tradition of rainwater collection in some parts of Alaska and Hawaii. City of Austin, Texas, offers rebate for using rainwater for some household uses. According to the "Sourcebook Harvested Rainwater", in some areas of the Caribbean, new houses are required to have rainwater capture systems. Hawaii apparently is currently developing (or has already developed) guidelines. The island of Gibraltar has one of the largest rainwater collection systems in existence. Rainwater offers advantages in water quality for both irrigation and domestic use. Rainwater is naturally soft (unlike well water), contains almost no dissolved minerals or salts, is free of chemical treatment, and is a relatively reliable source of water for households. We have found keen interest on rainwater collection in the arsenic affected areas. We have selected all local materials and local carpenters and potters made rainwater collecting 12 units at worst affected poor rural areas. Water filter is also under construction. It is possible to collect a huge amount of rainwater. Rainwater collection makes the life of the women comfortable as they do not require carrying water from a long distance. Rainwater collection and filtration will be emphasizing during 2nd phase of the project. Advertisement in the newspaper to use rain- water does not have any affect on villagers. 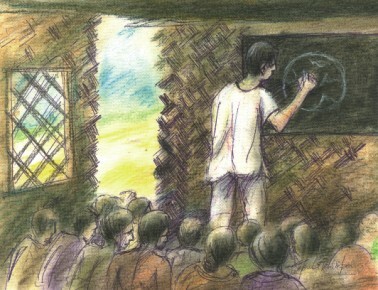 If simple method is shown practically, the villagers can easily repeat it. The development of a rainwater-harvesting plan that is economically and technically feasible for the majority of the people in Bangladesh should be given high consideration as a part of the integrated water resources management plan. Water Filter will be produced at 2nd phase of the project as clay pot cannot produce at this time of the year. We have set filter at a dug hole. If this experiment becomes successful, all dug holes will be equipped with such natural filter. No chemicals will be required for water purification. Purbo Gangabarti Village, at Koijorri Union, Faridpur is one of the worst arsenic affected areas of Bangladesh. 12 persons have already died and several at present suffering from arseniocosis because of drinking arsenic contaminated water. Villagers do not have any alternative but to drink arsenic contaminated water. We have made available to all villagers to obtain arsenic free water. We have achieved a very cordial relation with the villagers. Villagers prepared food, rice cakes for the workers. We have installed 7 dug holes and 25 rainwater-harvesting units in this village. The mind is a tree; the five senses are its branches. Hope bears fruits and leaves in abundance. of this tree's growth and destruction. in samasara to receive pain. We organised two village concerts on traditional Bichar Gan "Song of Justice" which continued the whole night. Motivation through traditional cultural heritage can conquer many obstacles. Mumata a twenty two year young folk -singer spell bound the audience by her simple arguments and traditional music. Traditionally this country lived with harmony to nature, which reflects in ancient Boul, Murshidi, Jari, Bhatiali songs. Bangladesh has developed over the centuries an excellent social situation based on humanism and secular thought - a very modern trend of social advancement Europe had known during the renaissance. Mainly four streams mingled in this social thought process - tribal anthropomorphism, Buddhist nihilism, Hindu vaiishnavism and Muslim sufism. These four historical forces plus the various local mystic cults of different obscure religious sects which cast and class distinction and autocratic establishment prompted ancient Bangladesh to develop with the hopes fought relentlessly against religious fundamentalism, orthodoxy, fanatism, crude and aspirations of the common men and their philosophy synthesis. Social dynamics of rural Bangladesh is rooted in this cultural synthesis and religious tolerance. In the 16th Century Bangladesh was the first and only country in the world that introduced religion freedom and during this time the country flourished at its highest peak. There are many accounts and references, which point out that the ancient people of Bengal, were different in race, culture and language from the Aryans. 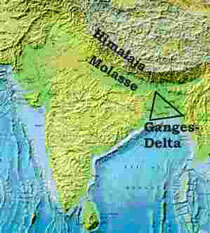 The original inhabitants of Bengal were non-aryan. According to Sylvan Levi, the primitive people of Bengal spoke a language that was neither Aryan nor Dravidian, but belonged to a separate family. Lying at the crossroads of South Asia and Central Asia, Bengal attracted people from early civilisation of the Fertile Crescent. It is now generally held that the Nishadas or Auastric-speaking peoples of Bengal laid the foundations of the agriculture-based village life, which is also believed to be one of the foundations of Indian Civilisation. It may be presumed that Bengal developed a culture of its own which was non-Vedic and non-Aryan. It is true that Aryan culture, and the Vedic, Buddhist and Jaina religions influenced Bengal. The primitive culture became absorbed but it also influenced adopted religion. Prof. Alan Dundes of the University of California, Berkeley wrote: "Bangladesh may be one of the poorest nations on the face of the earth, but I can tell you from the folklorist's perspective, it is clearly one of the richest." This is a pleasure and at the same time painful to inform that project goal has been achieved more than expected target but thousands of contaminated villages remained untouched. There are 85, 000 villages in Bangladesh. 76 per cent of rural households has less than minimum required energy (2, 273 calories daily per person) intake level. UNICEF studies show that 51 percent of households are both energy and protein deficient. There is also deteriorating trend in vitamin intake level. 93 per cent of households has deficient in calcium intake, 87 per cent has deficient in vitamin C intake, and 96 per cent has deficient riboflavin (vitamin B2 ) intake (UNICEF). Arsenic poisoning in Bangladesh is more serious than any other countries of the world. Dose response toxicological studies will be difficult to correlate with other parts of the world. All we need now urgent mitigation activities. The famous daily news paper of Germany Frankfurter Allgemeine Zeitung (FAZ) describes (26. 05. 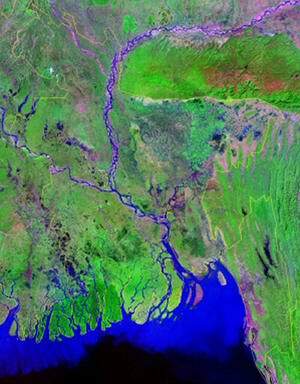 02), "Arsenic poisoning in Bangladesh is the largest environmental catastrophe of history." Educational program, dug wells, uncontaminated aquifer and rainwater harvesting have obtained great acceptance. The total budget of the project (Phase 1 and 2) is about 13 000 US dollars. There is a great misunderstanding on arsenic poisoning. It is easy to convince the persons with arsenic lesion to drink alternative water but those who does not has arsenic lesion thinks, it will not happen to him. Besides people has developed taste for drinking water containing iron During winter months people drink water directly from the tube wells because it is warm. More educational program is needed. School curriculum should include arsenic in drinking water as a major subject. This has been observed many extreme contaminated areas were not visited by any NGOs or Government agencies. Some green coloured tube wells found to be above Bangladesh standard (arsenic contamination). We have identified many areas in Faridpur district that needs urgent help. Piara Begum (27Year) is suffering from extreme arsenocosis at village Noroshia. Almost all wells in this area are contaminated. This was not in our project area. We could make only rainwater harvesting for the family (see images rain water harvesting). At the same time it is more painful to write the sufferings of millions. There are hundreds of villages that either tested or obtained any mitigation. We have visited villages like Norsinhia, Madhabpur, Mallikpur, Boalmari, Kuzurdia, Bangdoba, Kasnail, Laskarkandi, Tulagram, Moradaha, Banogram, and many more that urgently needs arsenic free water. Our project is very small - only a drop of water to fill an ocean. It is very painful describe that we could not help numerous rural poor poisoned to painful sufferings and deaths. The second phase will emphasize on more sustainability of the project. The principal goal of this project is to introduce environmental consciousness education, least cost-effective, efficient and appropriate method of water purification, arsenic removable, health and disposal in the light of adaptability, social acceptance, sustainability and easy reproducibility within Bangladesh environment. Disposal of arsenic precipitates in cow-dung pits.